I love a rainy night. A rainy day, too. 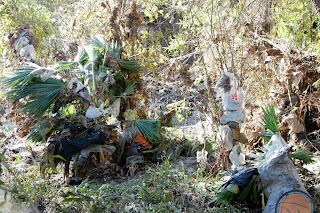 But I'll never forget the mountains of trash that wash into Southland waterways after storms. 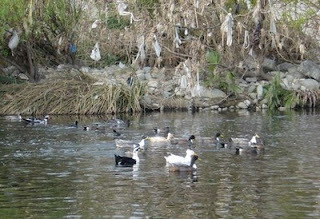 It's particularly depressing to see trash strewn in the branches of trees and shrubs, as you can see behind the ducks in this picture of the Glendale Narrows stretch of the LA River. 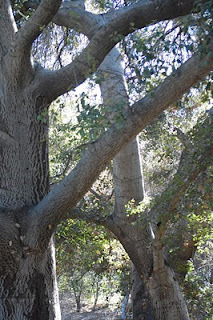 I took the photo above (and the one below) a couple weeks ago along the Rio Hondo, a tributary of the LA River. In addition to the ubiquitous shopping carts, plastic bags, styrofoam cups, soda cans, etc, there was a surprising number of rubber balls. Film plastic is so light-weight that it blows out of trash cans and recycle bins easily. 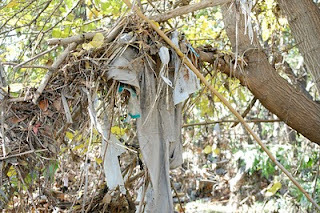 People who live near the Puente Hills landfill have watched the white baggies blow into their neighborhoods for years. So to help you with a New Year's resolution to not lose sight of any plastic, following is a transcript of a radio story I reported a few years ago about the ecological implications of plastic accumulating in the environment. KPCC ANCHOR: California has a reputation as a green state: a place where people care a lot about the environment. So you’d think that we’d have solved a basic environmental problem like litter. But public works crews haul tons of litter out of waterways every time it rains. Much of it is plastic. And, as KPCC’s Ilsa Setziol reports in the third part of our series on trash, some of the plastic is ending up in the ocean. SETZIOL: After a fall rainstorm, nine women inmates haul trash out of a channel that flows into Newport Bay. Gloria Sauer with Orange County public works oversees the crew. SAUER: Girls, get all of the floatable stuff. All of the trash and debris you see, the styrofoam cups and the glass, okay. SETZIOL: The trash is caught behind a net that public works has installed to try to keep it from flowing into the bay and out to the ocean. In about an hour, the crew hauls out a couple hundred pounds plastic cups, water bottles, broken furniture and other trash. Orange County is still trying to get a handle on the total amount of trash is blowing or washing in county waterways—and where exactly it’s all coming from. Vince Gin is with the OC watershed division. GIN: It could be a trash bag blown of a trash truck, or it could be a cup that didn’t make its way to a trash can. Sometimes, unfortunately it could be litter that someone has thrown out of a car and onto a street. SETZIOL: Despite local efforts to capture trash, some of it ends up in the ocean. Of most concern is the plastic, because it’s so durable. In a lab in Redondo Beach, Charles Moore with the Algalita Marine Research Foundation is examining what’s in the stomach of an Albatross from the Hawaiian islands. MOORE: Here we have a lid of some kind of bottle cap to a pen…different types of caps…Here’s a piece of jewelry. SETZIOL: And lots of pieces of red, yellow and blue plastic. Big ones. SETZIOL: An entire miniature, plastic toy bear. SETZIOL: Moore says the birds didn’t evolve with plastic, so they have no way to distinguish it from food. MOORE: They’re filling up on maybe a large percentage of non-digestible,non-nutritive plastic and feeding it to their chicks. So the chicks have what’s called a satiation reflex—it’s getting fuller and fuller and finally it stops demanding food from the parents. SETZIOL: Moore says about 70 species of sea birds have been found to eat plastic. Researchers have also documented sea turtles and whales killed or injured by ingesting plastic bags and mylar balloons. The Algalita Foundation thinks southern California is a major source. It sampled ocean waters at the mouths of the LA and San Gabriel Rivers and found 2 and a half grams of plastic for every gram of plankton at the surface--much of it very small pieces. ANDRADY: Smaller particles I contend would be far more damaging from an ecological perspective. Dr. Anthony Andrady is a polymer scientist with the research company RTI International. He says UV light gradually breaks plastic into smaller and smaller pieces. His research has found that krill and other zooplankton will eat significant amounts of microscopic plastic. ANDRADY: That is particularly disconcerting because the food pyramid rests on zooplankton health. But whether that has an effect on them we don’t know. SETZIOL: Researchers in Japan have found that pieces of plastic placed in seawater will absorb PCBs and other toxins. But scientists don’t know if marine life that eats plastic would absorb any of the pollution. ANDRADY: It’s an unanswered question and when you have an unanswered question of this magnitude, it’s worrisome and we need to find an answer to this. SETZIOL: Plastic doesn’t just breaking down in the ocean. It fragments on land and in rivers. The Algalita Foundation points out that the nets public works departments use capture trash don’t snag the small stuff. GIN: We can only pick up so much. Vince Gin of the Orange County Watershed Department. GIN: Trying to fight the problem by combating it after it’s already in the system is a losing battle. We have to work on reducing how much trash we create; prevention is absolutely key. 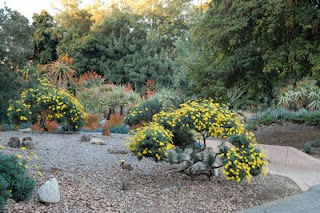 I frequently advise would-be native plant gardeners to start with a trip to Rancho Santa Ana Botanic Garden in Claremont. 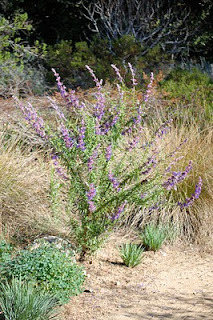 It's a beautiful place to see the California flora in a garden setting. and wooly blue curls were, well, just their gorgeous selves. 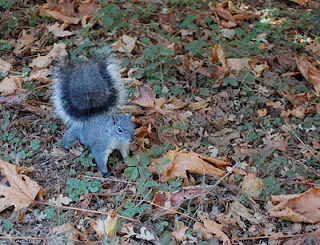 I spotted some (Oregon) juncos, rested under some twisting oaks, and, yes, had a little chat with this Western gray squirrel. Notice that compared to the non-native fox squirrels, its tale is bushier and grayer, and its belly is white, not yellow. The garden is handicap accessible and stroller friendly. 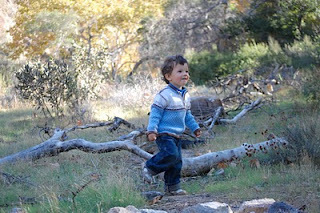 It's a great place for children to toddle or run, and explore. 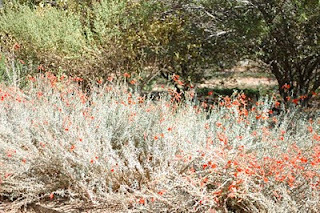 Rancho offers a free monthly Native Plant Clinic, in which experts answer your gardening questions. 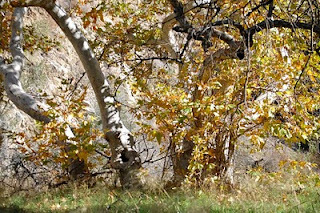 For years, Placerita Canyon, on the northwest edge of the San Gabriel Mountains, has been on my list of places to go. On a windy day late this fall, we finally made the trip. Gold was discovered here in 1842--six years before Sutter's Mill. The gold rush didn't last, but Placerita later became a popular location for film and TV shoots. 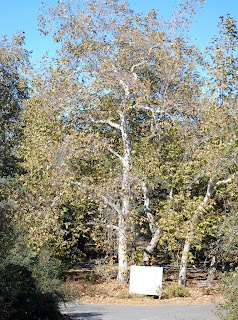 Placerita is a lovely sycamore-filled canyon. This time of year, the gold is in the yellowing leaves of the trees. To hike the canyon, take the main trail (on the right if you're facing the nature center). When you come to a fork, keep left to stay in the canyon. If you turn right, you'll loop back to the nature center--up a small hill with views of the Santa Clarita Valley. I mention this because, strangely, the nature center offers descriptions of trails, but no trail map. My son and his friend enjoyed observing a captive great-horned owl at the nature center. But otherwise the center itself was a bit of a disappointment: Few interesting exhibits; the staff was lurking in an office instead of with the exhibits or some place the public gathered. Still, according to its website, the park offers family nature walks and live animal presentations. Our son still naps, so for longer trips like this, we break up the return with a lunch stop. This keeps him from cat-napping in the car and missing a longer nap in his bed. For this trip, we lunched in downtown Montrose. From the intersection of the 5 and 14 Freeways, head east a few miles to the Placerita Canyon Exit. Turn right on Placerita Canyon Road and travel 1.5 miles to the park entrance. I was delighted when Emily Green asked me to interview Ronald Lanner for her website Chance of Rain. I adore his beautiful book "Conifers of California" (Cachuma Press). Of course, I proceeded to propose a really depressing topic: how global warming might effect California's forests. It wasn't a cheery conversation, but, if you care about trees and the animals that live amongst them, you should give it a look. IS: Several studies have found animal species are shifting their ranges northward and upslope in response to warming. Are we seeing changes in conifer distribution? RL: It’s hard to know for sure. Unless you do a controlled experiment over long period of time, you’ll not get definitive answer, but there are strong indications. At high elevation, where lodgepole pinegrows, it has, for a good number of years, been invading meadows. 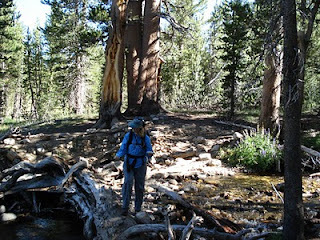 And mountain hemlock has also done that in the Sierra. It’s believed that ponderosa pinehas had an increasing mortality rate at its lower elevation and is tending to do best at higher elevations. The discussion continues on Chance of Rain. Plant lovers rejoice! Lili Singer is once again writing for Los Angeles Times Home. Singer knows more about gardening and Southern California friendly plants--both natives and exotics--than anyone I've met. 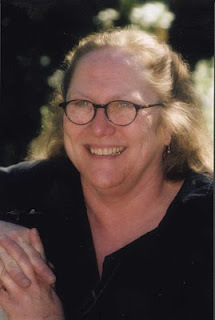 What's more, she shares her knowledge with enthusiasm, lucidity and lovely prose. So look for Singer's new column online and in the paper. She teaches at Theodore Payne (where she serves as special projects coordinator), the LA County Arboretum and other venues around town. I'm a huge fan of the Arb's Thursday Garden Talks with Lili Singer. This winter's series looks fantastic. Singer's guests will include irrigation expert Bob Galbreath, edible landscape pioneer Rosalind Creasy, and native plant guru Bart O'Brien. 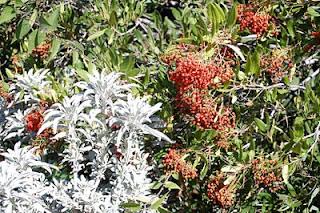 Also, Jerry Turney will cover the fundamentals of landscape diseases and Jan Smithen will lecture on great Australian plants for So Cal gardens. To sign up for one or all of the 8-class, Thursday-morning series, call 626-821-4623. This lovely and rare brodiaea (Brodiaea filifolia) was afforded additional protection this week when the U.S. 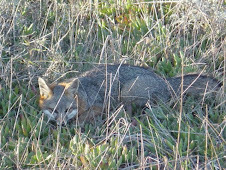 Fish and Wildlife Service expanded the acres designated as critical habitat for the endangered species. (This photo was taken by David Bramlet.) The flower only grows in isolated pockets of Los Angeles, Riverside, San Bernardino, Orange and San Diego Counties. Under the Bush administration, the agency had registered less than 600 acres as critical habitat for the species. Nearly 3,800 acres will now be official labeled as "essential to the conservation of the species." 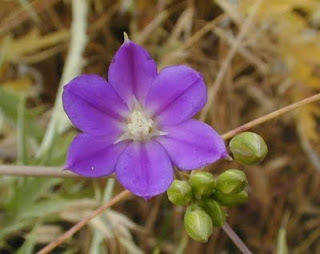 According to the Center, the flower is threatened by a combination of urban development, off-road vehicles, grazing, and plowing for fire clearance and agricultural conversion. 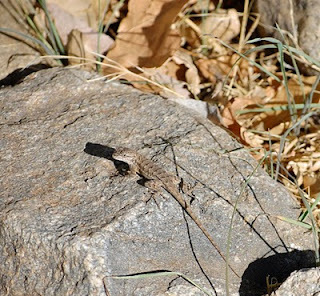 The designation has the greatest effect on public lands, where federal agencies, such as the US Forest Service, usually take some additional steps to protect the species. The Center for Biological Diversity has petitioned the agency to overturn or revise Bush-era decisions affecting more than 50 species. 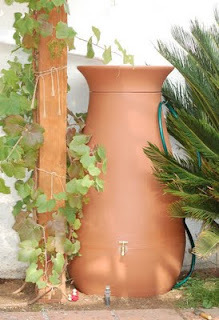 The results are in: Our rain barrel, Urna Therma, isn't just a beauty, she gets the job done. When we installed her, weren't sure how much water we'd capture. But that one late October rain filled her shapely figure to the brim. So Urna may get a baby sister one of these days. I use that tap on the bottom to fill my son's tiny watering can and water seedlings. For my two-year-old, it's a good alternative to the hose, i.e. he can't blast mommy with a hose. With a little planning you can forego a rain barrel and channel rainwater directly into your garden. You can find details on a page of the TreePeople website. Either approach can keep water from flowing off your property. Once it hits the street, runoff picks up pollution that can be transported into waterways and out to the ocean. Santa Fe Dam Recreation Area is a large flood control basin that straddles the San Gabriel River as it descends from the San Gabriel Mountains into the valley near Irwindale. 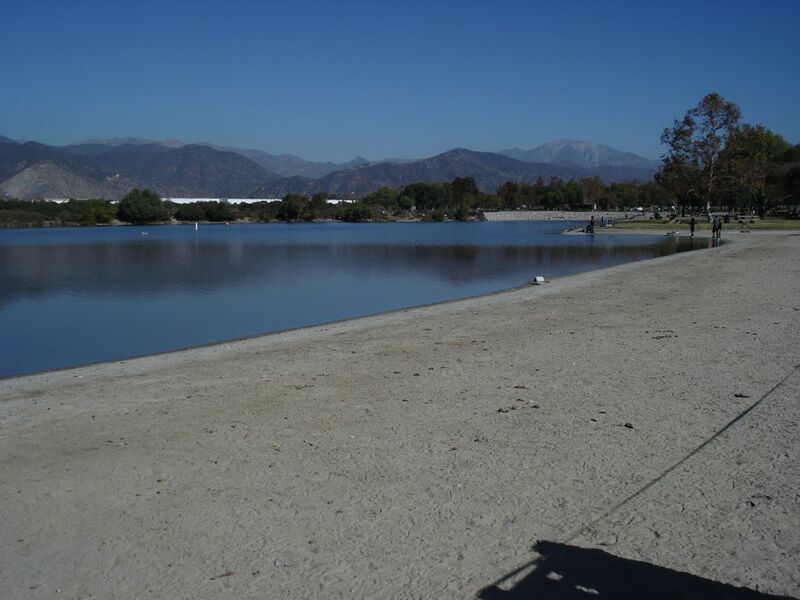 The more than 800 acres here feature a large lake for fishing and paddling, a nature center, picnic areas with barbeque pits, playground structures, and miles of smooth, flat biking trails. In the summer, you can swim in a water play area. 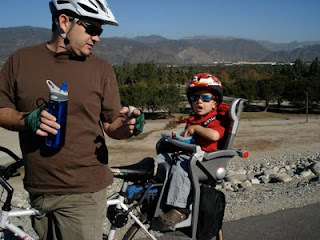 We recently spent a Sunday morning biking the top of the dam, then played in the park/picnic area. 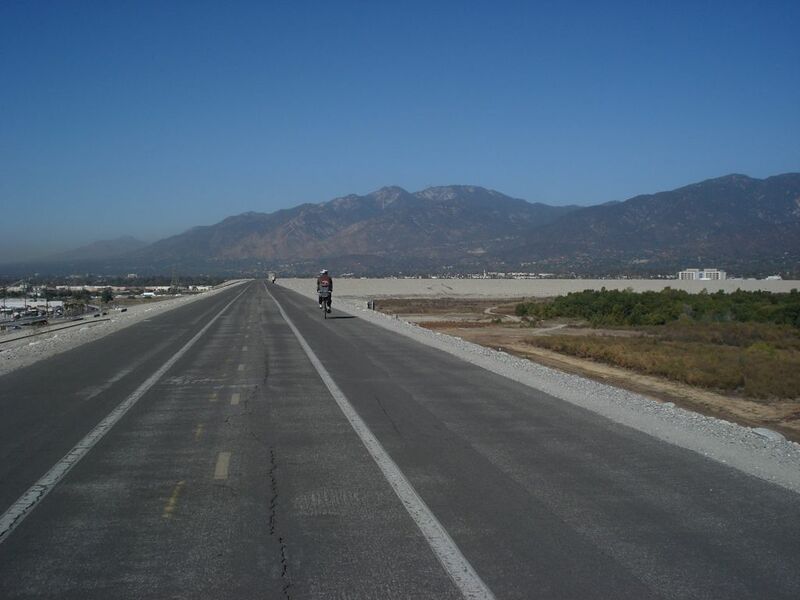 A ride atop the dam affords great views of the San Gabriel Mountains. 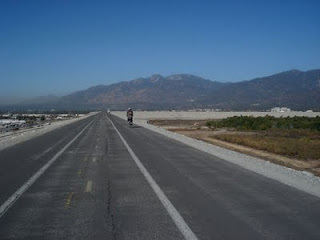 (My son preferred the views of the 210 & 605 Freeways.) I also enjoyed watching a gorgeous white-tailed kite fluttering and diving down on rodents. 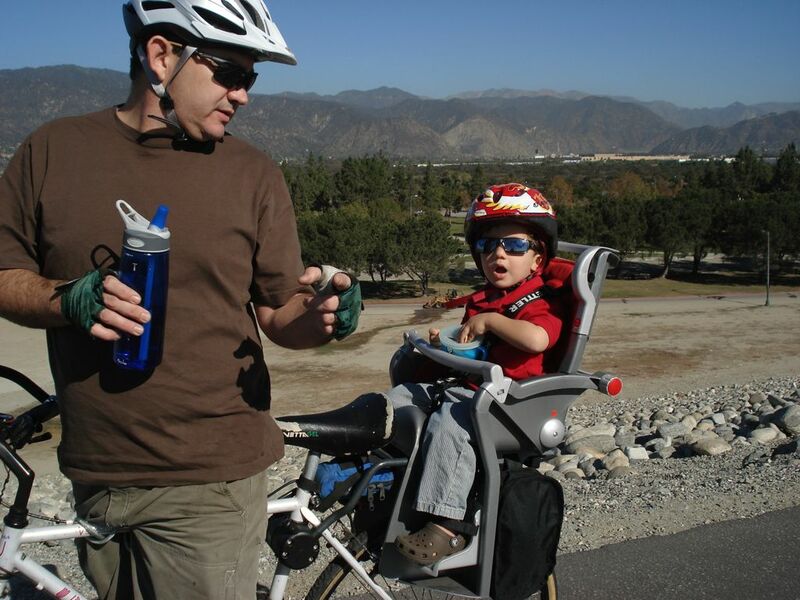 Well-maintained, smooth trails--perfect for little kids on their own bikes--skirt the lake. Slightly older kids can also ride the dam top. One note: there is no shade atop the dam, so I would not ride here midday in summer. Trails around the lake are shadier. We plan to return for swimming, fishing, bird-watching, and chilling. From May to October, there is a fat $10 fee to drive into the recreation area. (No charge the rest of the year.) But it's money well spent; the park is well maintained. For more dam biking, try Hansen Dam.